For some people the ideal mental image of the happiest day of their life involves a flowing white dress, an English country village and a traditional church filled with family and friends. For others it involves golden sands, palm trees and guests in bikinis. 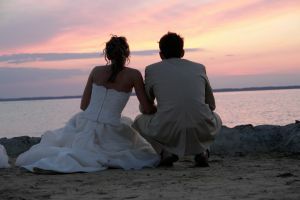 If you find yourself leaning more towards the latter fantasy wedding, then perhaps a wedding abroad is for you. So why choose a wedding abroad over a traditional wedding in the UK? There are a multitude of reasons – including weather, novelty and most surprisingly, cost. Many a British wedding has been rained out to the utter dismay of the (slightly less) happy couple, so the attraction of hosting a wedding in a tropical paradise – where blazing sunshine and temperate climate are almost guaranteed – is easy to see. Obviously it is important to avoid the rainy seasons, but in general the weather for your big day will be assured compared to the unpredictable UK weather. The novelty factor of having your wedding abroad cannot be underestimated. Whilst your friends will look back in years to come at the same ‘cookie-cutter’ wedding photos that are indistinguishable from every other wedding – you will be able to look back at photos of you enjoying the happiest day of your life on an exotic beach, the top of Niagara falls or wherever else your imagination can conjure up. Your unique wedding abroad will also never be forgotten by your guests – but if you are planning a wedding abroad make sure to send your invitations out considerably earlier than you would for a wedding closer to home, to allow your guests to make travel arrangements. Surprisingly the difference in cost between a wedding abroad and a wedding in the UK can often not be as extreme as you might think and this can be for a number of reasons. The average spend on a wedding in the UK is usually between £20,000 and £30,000. If you are planning to hold your wedding on an island in the Caribbean, where the local currency is generally dollars, when you take into account the exchange rate you can certainly get a lot more bang for your buck. As you will be spending a considerable sum on the arrangement of the wedding, it is also worth looking into international money transfer as a secure way of paying for the venue. Finally it pays not to forget that the marriage ceremony is a legal procedure as well as celebration of your union, so be sure to research the relevant legal considerations of the country you are planning to be married in, as this can vary from country to country. Since the global economic recession of 2008 began, life has been difficult for the everyday American. The cost of living has increased and it has become tough to manage competing priorities. Wage freezes, unemployment levels of 9.1%, a struggling real estate market and an increase in day-to-day living expenses have all combined to make it harder to survive, let alone prosper! Yet most Americans do not have a safety net to help overcome these financially tough times. Statistics suggest that one in four citizens do not have any savings at all. This is a worrying situation, as a lack of savings means there is no emergency fund for when the going gets tough. A range of financial products can help with savings, such as those offered by short-term loan companies. The recommended amount of savings suggested by industry experts is the figure you would need to cover a minimum of six months without an income. Yet only around 25% of all Americans have such financial security and these tend to be higher wage earners in the 50-60 years age bracket. In today’s economic climate, it can on the surface seem hard, if not impossible, to find the money to save. Many households are experiencing increasing levels of debt instead. According to published statistics, Americans have just under £118,000 dollars of debt per household. The combined personal debt of all Americans reaches a staggering $2 trillion dollars. Savings are essentially an emergency fund for when the unthinkable happens. We all like to imagine we live in a certain world, but illness and unemployment can affect anyone. Warnings and forecasts of a ‘double dip’ recession are hopefully nothing more than a worst case scenario, but those with savings have a greater piece of mind. How would you cope in such challenging circumstances? For many people, that can be a frightening thought. However, it does not have to be, because you can easily take action to create a safety net. Take a long, hard look at your income and outgoings. What could you honestly live without each month? A treat meal or night on the town, or perhaps the latest gadget or game? If you can save even a small amount each month, the dollars will quickly add up. $50 dollars per month multiplied by twelve months is $600 dollars per year to invest. It may not sound much but once you start saving, you will find that the great feelings it creates become addictive! Soon you will be happily contributing more each month to your emergency fund. After all, this is the basis of the American Dream, to rise up against adversity and carve out your own road to freedom and success. There is no greater freedom than financial freedom that comes from you yourself making the effort necessary, as the odds of winning the lottery are narrower than getting struck by lightning! People who create better financial circumstances for themselves and their families gain much more than an emergency money fund. They gain a peace of mind and feeling of accomplishment too. Create your destiny now.